The ability to get a list of currently running queries and a button to abort each one individually. This is IMHO a feature lacking in the classic Neo4j server. People getting started with Cypher tend to write queries that run very long, and there is now a way to abort them. The goal is not to create a full fledged alternative to the existing Neo4j server. This project should focus on maximum throughput and ease-of-use for a Cypher-only server component. To get started, I’ve cloned https://github.com/ratpack/example-ratpack-gradle-groovy-app. You’ll find my code at https://github.com/sarmbruster/neo4j-ratpack. In Ratpack you either write inline handlers in src/ratpack/ratpack.groovy or, for more complex cases, write a handler class derived from AbstractHandler and register that in ratpack.groovy. Ratpack features Google Guice as well, so we can register, for example, a GraphDatabaseService as injectable component. See Neo4jModule. We’re exposing and configuring a GraphDatabaseService, a Cypher ExecutionEngine, a guard (see below), and a QueryRegistry. We can refer to other components using the @Inject constructor annotation. The core piece of code is CypherHandler. It parses the Cypher command and parameters out of the request, runs it, and renders the result depending on the requested content type. In neo4j-ratpack, the guard is exposed as a Guice component, so any ratpack handler can just inject it. Each query is registered with a QueryRegistry. Part of that process is setting up a VetoGuard that throws an exception based on a boolean flag. In case of an exception, the query is aborted. 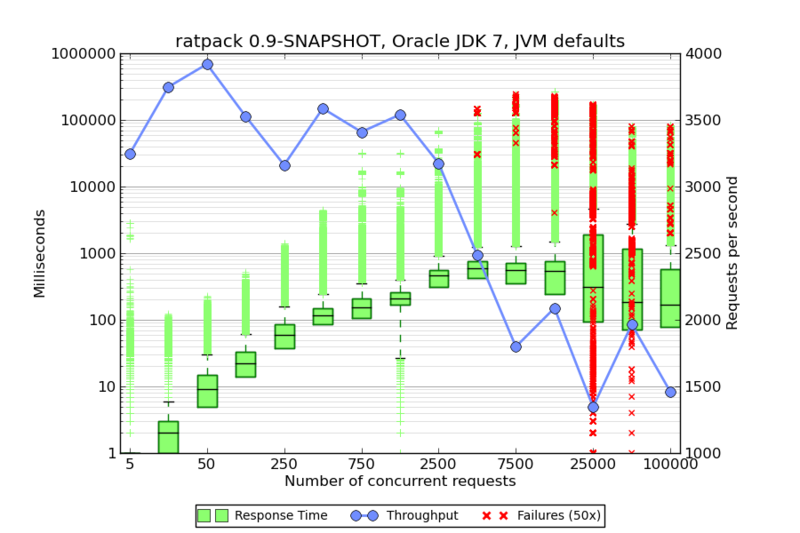 The next step was running some load tests to a standard Neo4j server and neo4j-ratpack in order to compare the performance of the server components. All tests were run on my ThinkPad x230 (i7-3520M, 2.9GHz, 16 GB RAM, Ubuntu 13.04). For simplicity, load generation and the server itself were running on the same machine – which is by far not perfect, but a starting point. 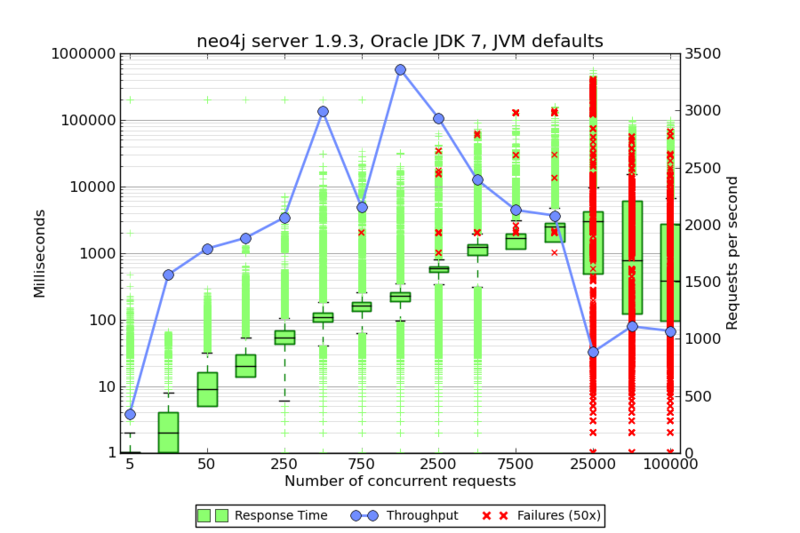 The intention of these load tests is not measuring Neo4j itself – it focuses on the server component only. ...with different parameters against a graph DB consisting of 1.6M nodes, 7M relationships, and 7M properties. Kudos to my colleague Alex who helped me setting up the dataset based from the LDBC project he’s involved with. The same graph.db was used by both Neo4j server and neo4j-ratpack. No specific JVM tuning parameters were set. 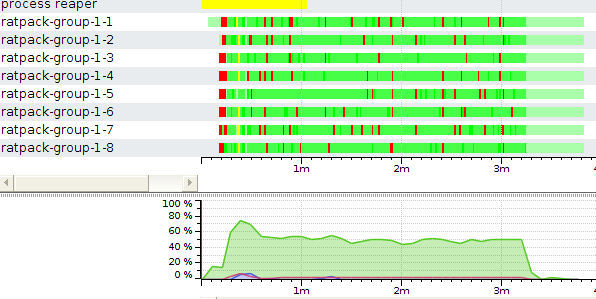 I’ve run the load test with an increasing number of concurrent threads and focused on observing throughput and latency. The following diagrams were created using a Python matplot script orginating from http://www.metaltoad.com/blog/plotting-your-load-test-jmeter. Please note, the latency is displayed in green on a logarithmic axis. Throughput is in blue on linear axis (ranges are different for the diagrams). We’re observing an increasing rate of errors when going beyond 25k threads. Since the load generator is colocated with the system to test, this seems to be point where JMeter’s own memory and CPU consumption influences the system under test too much – so we’ll disregard the range above 25k. The most interesting finding is that with Ratpack, the latency remains nearly constant in the range of [2.5k - 10k] threads, whereas the standard Neo4j server shows increasing latency. 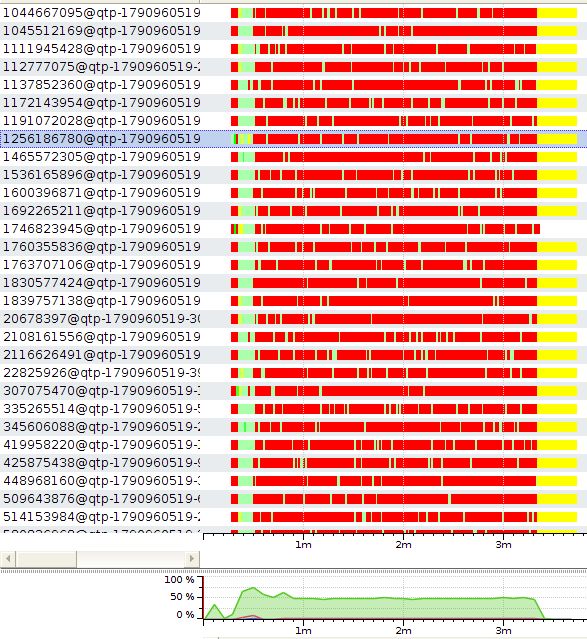 It’s interesting to see that Neo4j server uses 10 worker threads per core (40 in total on my laptop). Most of the time, most of them are in blocked status indicated by the red color. Ratpack, on the other hand, has 8 worker threads being mostly in ‘green’ aka runnable status. So Ratpack indeed uses non blocking IO. For Cypher-only use cases with high concurrency requirements, using Ratpack instead of Neo4j server might be an interesting alternative. However be aware, Ratpack is bleeding edge, the current version is 0.9-SNAPSHOT. Published at DZone with permission of Stefan Armbruster , DZone MVB. See the original article here.